Awarded to Products we believe are best value for money. Awarded to products having best features, solid build, great performance or innovative idea and also available at a reasonable price. Awarded to products which are top of the line with top performance regardless of their price. 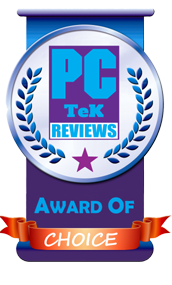 PC TeK REVIEWS Choice award is only give to the products that we believe are the very best in that particular category. All material on this site, unless expressed otherwise or implied by hypertext link properties is copyright PCTeKREVIEWS.com. You may use the content for personal, non-commercial and non-public use ensuring you comply with all relevant copyright laws. Every effort has been made to avoid errors or omissions. In spite of this, errors may creep in. Any mistake, error or discrepancy noted may be brought to our notice which shall be taken care of. 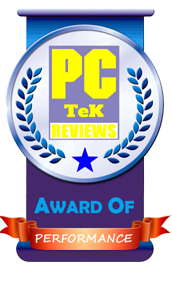 It is notified that neither PCTeKREVIEWS.com nor the authors will be responsible for any damage or loss of action to any one, of any kind, in any manner. 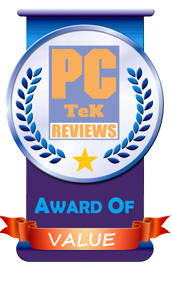 PCTeKREVIEWS.com recognizes the importance of protecting the privacy of you as a user of this Website. This Website does not collect Personal Information about you except for information that you voluntarily provide (for example, when you submit an email to us with comments about our web site or products reviewed on the web site and you do not specifically indicate that the information contained within is to be considered confidential or provide answers to a voluntary readership survey.) This website uses several cookies. They store technical information that allows us to better interact with your browser and to identify you on subsequent visits to our site. No Personal Information is gathered via these cookies.